"I think, depending on what kind of nerd or geek you are, there's an analytic and statistic aspect to (your) brain," she said. "When you're used to being prepared to reject conventional wisdom, it leaves you open to learn more." Science seems to be the rudder that steers the nerdy women in the attachment parenting community to make the decisions they do, starting with prenatal care and resulting in less conventional parenting methods. Bialik's studies in developmental neuroscience and the endocrinology of attachment behavior in humans made it especially obvious to her that biology and science were not meeting the needs of psychology. It was intuition that led her to natural childbirth and attachment parenting. "If you tell my body when to give birth, as somebody who thinks outside the box, it's intuitively wrong. It sounds wrong," Bialik said. Caryn Rogers, a science writer for the Preeclampsia Foundation and a self-described bookish musician nerd, was likewise ready to question medical professionals when it came to becoming a mother. Although she respects the education and experience medical doctors have that she doesn't, Rogers believes there are limits to what doctors can recommend to their patients with confidence. Like Bialik, Rogers was led to alternative childbirth options and attachment parenting practices through research. "I ended up developing a medical complication of pregnancy and needing every tool in the toolkit for us both to survive," she said. "Some conventional care doesn't seem to have good evidence supporting it, but more importantly, I think the culture tells very sketchy stories about pregnancy and childbirth and doesn't include argument or debate when we get this information." 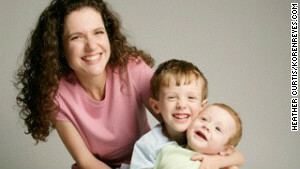 Heather Curtis with her sons Storm, center, and Chance. The search for both sides of the story led Heather Curtis, nerdy wife of FARK founder Drew Curtis, to practice many of the parenting methods Bialik supports. "I started out very much cowed by 'the doctor said it; it must be true,' " Curtis said. Feeling intimidated by the medical establishment, she began asking why. Why not extend breastfeeding? Is co-sleeping safe, despite the warnings? "Especially when it comes to attachment parenting, I think it's a reaction to quite a few years of the other extreme," Curtis said, citing drugged childbirth and some doctors' preference of high-tech formula over breast milk. Research of parenting issues often leads nerdy moms to question the alternative as well. "I hate to see anyone pick one study and hold it up as evidence that the whole edifice of care is wrong," Rogers said. "Also, I love to see one study shift the whole paradigm." And although mass media are holding Bialik up as the poster child of attachment parenting, she's the first to admit that the attachment parenting community is not monolithic. "There are parts of the attachment parenting world where I'm considered very strict, and there's people who make me look like a tiger mom," Bialik said. "The fact that we don't use paper towels but I still use tinfoil, in some circles, is 'Ooh, she's not all the way holistic.' "
Both Rogers and Curtis chose to breastfeed their children for an extended time, co-sleep and wear their babies in slings, like Bialik did. "It would be weird to impose those practices on a child who didn't benefit from them, I suppose," Rogers said. "But if my child is clearly benefiting, why would I harm him just to conform to what other people think I ought to be doing? I'm a nerd, after all. I don't care much about conforming." That includes conforming to Bialik's standards. For example, Bialik's preference for not requiring her children to say "please" or "thank you" is something Curtis feels quite the opposite about. "I'm big on my kids being conventionally polite, and it works really well for them," she said. "Have a 2-year-old say 'excuse me' and 'thank you,' and watch just about any adult melt." One aspect of alternative parenting that nerdy moms can not ignore is their fairly unconventional children. Often, these nerdy children help connect mothers within the attachment parenting community. Bialik, whose sons attend Jedi (yes, as in "Star Wars") classes within her circle of homeschooling mothers, said, "We wear our nerddom on our children. Absolutely." "My child beat me at chess when he was 4 and memorized the 'Axis and Allies' rulebook shortly thereafter," said Rogers. "Plus he quotes Monty Python and George Carlin and goes to as many parties with academics as he does with kids from his school." Curtis said she tries not to express her own nerdiness on her children. "They're going to be odd enough, being my kids!"